Weight gain is commonly reported by breast cancer patients on tamoxifen or aromatase inhibitors. Since weight gain may impact on outcome and compliance we have prospectively assessed the effects of these agents on weight change in three randomised trials for the treatment or prevention of breast cancer. 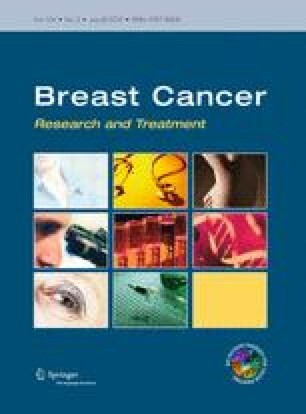 Data on weight change in postmenopausal women from three large clinical trials investigating endocrine therapy for the treatment or prevention of breast cancer were analysed (ATAC, IBIS-I and IBIS-II). In the IBIS-I study, mean weight change on tamoxifen was +0.1 kg (SD 0.1) compared with +0.3 kg (SD 0.1) in women taking the placebo (P = 0.3) between baseline and 12 months of follow-up. In the IBIS-II trial, no statistically significant difference was found between anastrozole and placebo after 12 months of follow-up [+0.8 kg (SD 5.3) vs. +0.5 kg (SD 7.4), P = 0.5]. In the ATAC trial, no statistically significant differences in weight gain between anastrozole and tamoxifen were found after 12 months of follow-up [+1.4 kg (SD 3.9) vs. +1.5 kg (SD 4.0), P = 0.4]. Significant baseline predictors for gaining more than 5 kg of weight after 12 months of follow-up were: being younger than 60 years old, smoking and mastectomy. All three trials demonstrate that weight gain occurs primarily within the first 12 months of active treatment in a subset of patients. In the prevention trials, weight gain does not differ between anastrozole, tamoxifen and placebo and also did not differ between anastrozole and tamoxifen in the treatment trial. Presented at the 2011 ASCO Breast Cancer Symposium, San Francisco, CA, September 13–15 2011. This analysis was supported by the Cancer Research UK and AstraZeneca. Ivana Sestak, Michelle Harvie and Anthony Howell have no conflict of interest to declare. Jack Cuzick received research funding from AstraZeneca. John F. Forbes received honoraria from AstraZeneca and Novartis. Mitch Dowsett received consultancy fees, honoraria, research funding and expert testimony from AstraZeneca.